Come and join the pathfinders to create a new system, revealed by God (I Am) in 1992. The pay is initially lousy, but the rewards are enormous – Love, Happiness, health, peace, success. and prosperity (plus much more). Notice how the pay is initially in the currency of Love – Contentment, Joy, Ecstasy and Bliss! Once we have these things, then the money starts to flow! Everyone knows we don’t live by bread alone. We are icebergs and the extent we show to the world is controlled by the size of the iceberg under water! 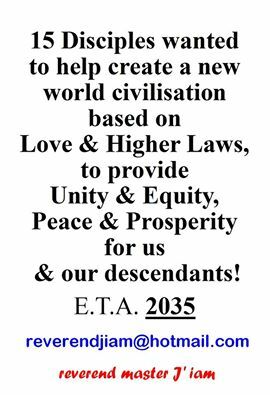 The only way to grow our iceberg is to serve God, I Am and Love, to help create a Divine Civilisation! This is what I am offering you here! Every one knows the old trees are falling, come and tend the young shoots, new trees, waiting at the base of the trees, just biding their time! These new saplings are the future of the forest, the nascent divine civilisation promised by God! Thought I’d share what God pointed out to me (quite strongly, I may add! lol!) this morning. How can Love be the root of any evil? Pure Love comes from God alone and is surely the Root of all Goodness in the world! So it must be the lack of Love that is the root of all evil. And the lusting after money is the root of many, not all, evils! It is only by us learning to truly Love money (spiritually) as a tool of goodness that we can change the world into a better place, transform the world from a cesspool of evil into a Divine Civilisation! This is the true purpose of every awakened Soul – to help create a divine civilisation. And every soul is capable of doing this, no matter how simple or complex they are! Simple souls help create a divine civilisation in simple ways, complex souls help create a divine civilisation in complex ways! Often the simple souls are guides for the complex souls to follow. The simple soul that rescues a baby duck is a guide to the complex soul that saves a baby! The simple soul that holds open a door for the person behind them is a guide for the complex soul that opens a door of knowledge for mankind to enter through! We all have our place in God’s Divine Civilisation. May health, happiness, peace, success and prosperity be yours – for these things are the manifestation of the creators of a divine civilisation! And every path to a divine civilisation begins within ourselves! We have to lead by example, because “as within, so without”! We are the SEEDS of divine civilisation. Only by planting our seeds in the fertile soil of Love can we ever achieve anything useful and lasting. Therefore I ask you, in the name of the Glory of God, that you add your hands and heart to the cause of creating a divine civilisation Today, right now, immediately. 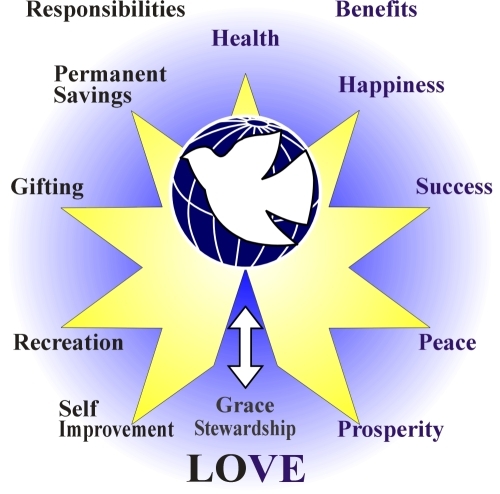 Image what the world will look like when 10% of the world is creating a divine civilisation with spiritual tools like WPPN (The Wholistic Peace and Prosperity Network). Sand Water and Oil! the three states. Of course the next part of the experiment is to shake the bottle violently to try and mix the three elements together. The bottle then looks like this – a mixture of sand, oil and water.. But of course the three being different densities, we put the bottle down to rest and wait for five minutes to see what happens. And what happens is that they separate back into there separate parts again! thinking) around the age of 8 or 9. The test for this is to ask the student to write a letter L upside down from their mind. The concrete based student cannot do this, having to have a cardboard L that he can physically rotate on the table. 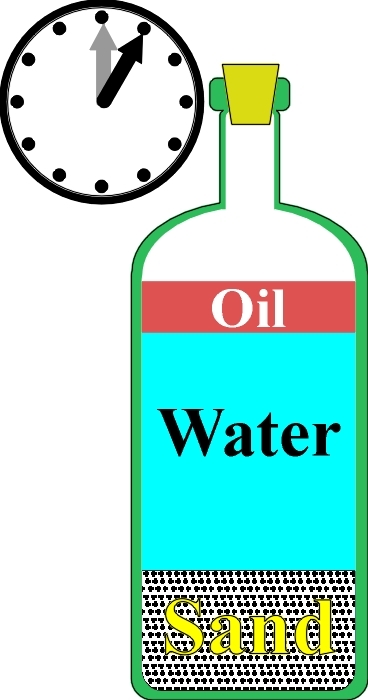 This simple little test is a sure fire indicator that the student has made the movement from the concrete world of the sand to the abstract world of Water – the metaphysical (although teachers don’t call it metaphysical). So this step is usually achieved in school, but we rapidly forget this test and still tend to work in the physical world and in adulthood this lack becomes a “Glass ceiling”. 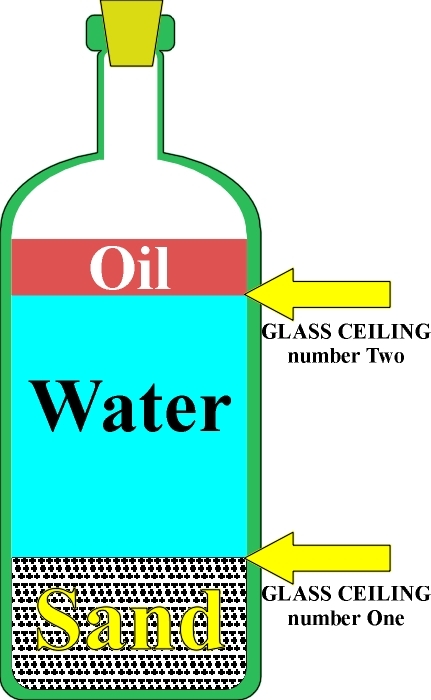 The second glass ceiling is even more subtle that the first because it is entrance into the spiritual world of oil. 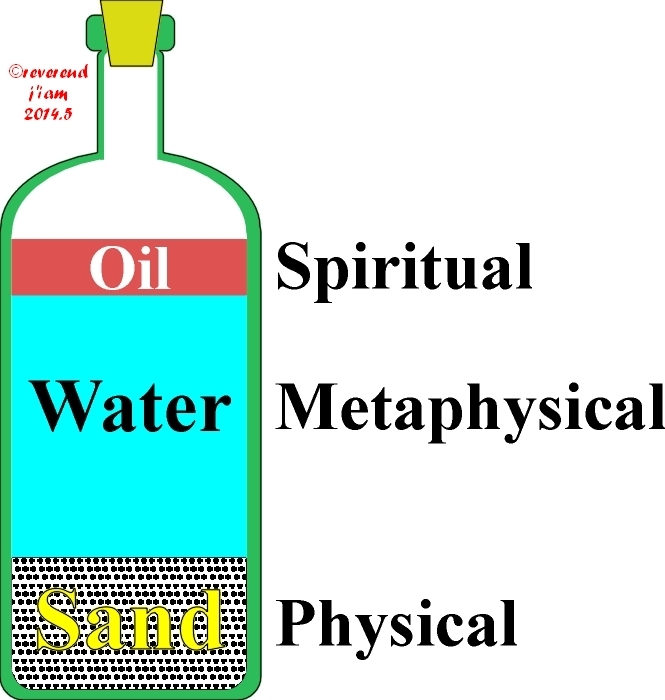 Know that most human beings are capable of moving from the physical to the metaphysical to the spiritual – from the sand to the water to the oil! The reason most people don’t move is because they don’t consciously ask to be moved! 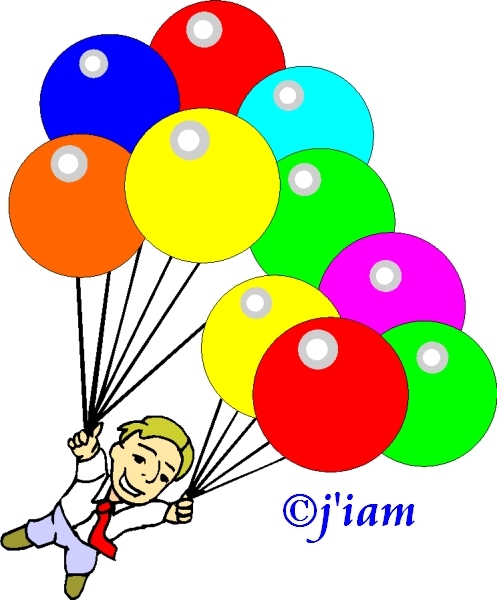 That is the main gist of many of my blogs – we have to ASK out aloud to make the move! The further you have to move the greater the effect will be! So some people have a very slight rebirth, whilst people like myself (who was at the extreme end of the physical realm) have a huge rebirth. It doesn’t matter which one you experience, it is still a HUGE step forward in life because we move from the two temporary realms of life to the permanent realm of life, from the temporary physical and metaphysical realms to the permanent spiritual realm! When we die in this world what happens? The body and the brain are annihilated – literally, whilst the soul continues to live on! It’s as simple as that.This is why the metaphysical ego fears death! Even if you’ve never had a single spiritual experience in your life you – the essential you, the one that thinks in the quiet times – still continues. Of course if we die without a single spiritual experience our souls are retarded on entry into the next world, a bit like a caterpillar that leaves the chrysalis without fully developed wings. We have a unique opportunity to get as close to God/Love as we can in this world in 70 odd years – voluntarily!!! If we miss this opportunty, we can NEVER get it back of our own free will – there is no free will in the next world (nor in the three world below us – the mineral, the vegetable and the animal worlds). Free will – the choice of either turning towards Love/God exists only in the human world! This is why our world is the end of darkness and the beginning of Light! So we are born into ignorance (sin is the old fashioned word form ignorance) of these three worlds and have to learn about them in our lifetimes and consciously have to move from the physical to the metaphysical to the spiritual. Life is simple as that. To put it another way, when we are born our first Primary Goal is to find the source of Love and make a conscious connection with it! Then our primary purpose in life is to make a generalized divine civilization(to leave this world a better place than it was when we entered it!). We can do this by simply having children and bringing them up to be mature and reasonable adults amongst other ways. Our secondary, and most important task, is to help create a specific divine civilization. That is to say by using our God given talents and abilities to help create a special part of divine civilization that no one else can do. Mother Teresa was one who did this. Of course there are many, many thousands who have done the same in many different ways. The difference between creating a generalized and a specific divine civilization is that you are usually offered the specific task (we have the right to refuse it!) whilst anyone can carry out a generalized civilization. My specific part in life is to introduce the Wholistic Peace and Prosperity Network to the world, so that it may replace capitalism as man’s main tool for wealth creation! Sell yourself on the product first! I learned my lesson many years ago when I joined Amway. I tried and tried and tried to sell a bottle of detergent to my mother in law but she just wasn’t open to it at all! So I went to my diamond and asked him what to do. And his words were “Sell yourself on the product first. When you really believe in it, it will sell itself!” So I went home and practiced what he said and after a month i realized what a great little product it was! The next day my mother in law came to see my wife and as she walked in she saw a bottle of LOC on the shelf and asked me ” What’s that?” To which I replied “That’s great stuff!” And she said, “Ill take a bottle!” Well, floor me! Lol! It was true, all I had to do was believe in my heart (as opposed to my head) in the product! So what product is the most important in all of our lives, the one we need to believe in, to sell? Why, ourselves of course! If we don’t believe in ourselves, then nobody else will! “To the level of our belief it will be returned to us!” if we truly believe in ourselves, then it will be returned multiplied. If we don’,t then it wont! Those are the choices we face. So work to find your true BEingness. Within that lays your life and your work for God/Love/Life. Because, what is our primary purpose in life? To help create a divine civilization! Raising good children to Be good adults is one of the most important tasks in the world! If we raise rotten children, what will be the effect on the world? To lower the overall standard of civilization within the world! If we raise good children what will the effect be?To raise the overall standard of civilization in the world! No one is ever just a mother, or just a father! Ever! We, all parents (well, most are parents), are all part of the creation of divine civilization! When my first son was born and I was alone for him for the first time a few minutes after his birth, I looked at that little soul and realized that I had been given a blank whiteboard to write on. I promised to make his life better than mine was and would be. At that stage I was an atheist and living on the physical plane only. It took me many years to grow into the spiritual plane, but I did my best to raise him better than I had (I had no spiritual values taught to me as a child – I was an artist raised in the army! Square peg, round hole! The armies solution was to BASH the square peg into the round hole! Luckily, I survived that. Lol!) and I tried to teach him about love and respect. Something must have rubbed off, because he raised to be a good boy and a good man. Of course with experience I learned a few tricks (as we all do) and raising the second and third sons was a lot easier! But today I have three good sons, all adults and all trying to find their part in creating a divine civilization. And I have four grandchildren and the process is carrying on down through the generations. We don’t only educate our children. We teach them how to teach their own children! And they will improve on the job we did, if they are good people! So a mother is a mother to at least two generations! And that is why we have to be the very best we can. We live day to day, but the results of that life are continued on down through time – through our children as adults and onto our grandchildren too. How can you do the best job possible? Believe in yourself! Be not filled with fear, doubt, worry and uncertainty! Be filled with knowledge, truth and hope and pass that onto your children! And you’ll find that you pass these qualities onto other adults, outside the family circle. You don’t often get feedback on how well you are doing in this area, but once in a while you’ll get a feedback. Accept it and know that you have just seen the tip of the iceberg, about how a big group of people feel about you! Love, yes LOVE yourself, wholly and unconditionally. It’s a pretty hard thing to start in this world of nay-sayers, negatives and knockers! But once you do start, you will see that even God Loves Himself first and foremost! If he didn’t, how could He love us? We are made in the image of God. We have every power except one (the power of creation) so how can we ever be small, weak and insignificant? We can only do that by not Loving ourselves, by locking ourselves away from the light of Love in a closed room. To enlighten the room we need to pull open the curtains and let the light flood in. And a step towards this is to Love ourselves wholly and unconditionally and to connect with the spiritual source of the universe! To Love God, I Am. the Holy spirit, the source of All Love, we need to start at home and learn to love ourselves first. This is the way of the spiritual path, no matter which spiritual path you are following! The closer the path gets to the source, the less the space between the paths until there is no different paths but only Love! You are the product of Love, the end product of your life should be Love(a divine civilization), so sell yourself to Love first!